Richard Akoto Appiah, the Ghanaian ICT teacher at Betenase M/A Junior High School at Sekyedomase in the Ashanti Region, who posted pictures of himself drawing the Microsoft interface on a blackboard because his school in Ghana had no working PCs, received a standing ovation at the Global Education Exchange Summit recently hosted by Microsoft in Singapore. A few days ago, Akoto, a 33-year-old information and communications technology (ICT) teacher in Ghana, became a social media sensation after he had posted pictures of him drawing a complete Microsoft Word window in multicolored chalk on a blackboard. He did this as he wants his students to learn digital skills even without devices. Microsoft honored Akoto’s dedication to teach at the Education Exchange (E2) in Singapore by giving him a standing ovation at a gathering of almost 400 educators and school leaders from 91 countries, who were there to discuss the role of technology in education and new methods of teaching that can prepare students for success in the digital age. Anthony Salcito, Vice President, Worldwide Education at Microsoft, praised Akoto for inspiring the world in his effort to help his students against all obstacles and meet their needs every day. In order to graduate, students at Betenase M/A Junior High School in Ghana are required to pass a national exam, which includes computer technology. Akoto who has devoted himself to teaching vital digital skills to his students wanted them to compete with the likes of students that do have computer access and not be left behind in life. Akoto who never traveled out of Ghana before, said in an interview, “They have some knowledge about computers, but they don’t know how to actually operate one.” However, as the school’s only computer and his own personal laptop were both broken, showing his class how to use a PC posed an important problem. He added, “I wanted to teach them how to launch Microsoft Word. But I had no computer to show them. I had to do my best. 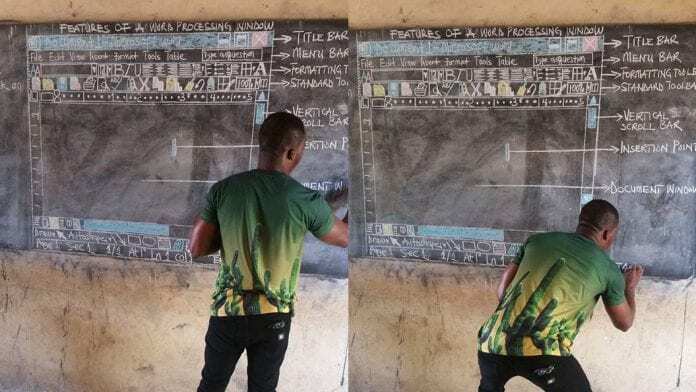 So, I decided to draw what the screen looks like on the blackboard with chalk,” he said. “I drew the features and labeled them correctly so that they would know what-was-what. Then I drew what you would see on your computer screen after launching Word. “I have been doing this every time the lesson I’m teaching demands it. I’ve drawn monitors, system units, keyboards, a mouse, a formatting toolbar, a drawing toolbar, and so on. The students were okay with that. They are used to me doing everything on the board for them. When I did this, it was nothing new or strange for them. “Something very positive has come out of this and I am very happy. We are no longer going to use the chalkboard again. We will have computers,” noted Akoto. Seeing Akoto’s extraordinary dedication towards his students, Microsoft has decided to work with him through a local partner in Ghana and provide device and software support needed for his students at his school in Ghana. He will also gain access to the Microsoft Certified Educator Program (MCE) for professional development, so he can develop his passion for teaching and build rich, custom learning experiences for his students. Besides Microsoft, a benefactor at UK’s University of Leeds recently donated a brand new laptop to Akoto’s school. In addition, Bluecrest College has also donated 5 desktop computers to Betenase M/A Junior High School, and one laptop for Akoto’s personal use.